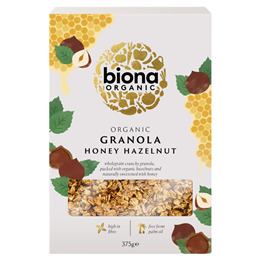 A scrumptious blend of wholegrain oats, hazelnuts, sunflower and sesame seeds, sweetened only with organic honey and lovingly baked into munchy golden clusters to make your morning special. Whole Rolled Oats* (72%), Honey* (19%), Sunflower Oil deodorised* (5%), Hazelnuts* (1.5%), Sunflower Seeds*, Sesame Seeds*. Enjoy as a healthy breakfast or snack. Contains gluten, hazelnuts and sesame seeds. May contain traces of nuts and lactose. 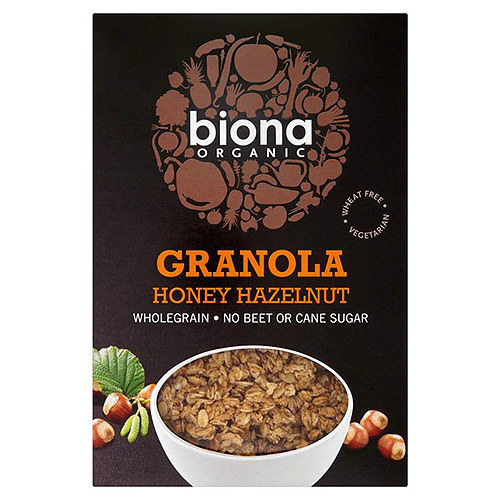 Below are reviews of Biona Organic Honey Hazel Granola - 375g by bodykind customers. If you have tried this product we'd love to hear what you think so please leave a review.